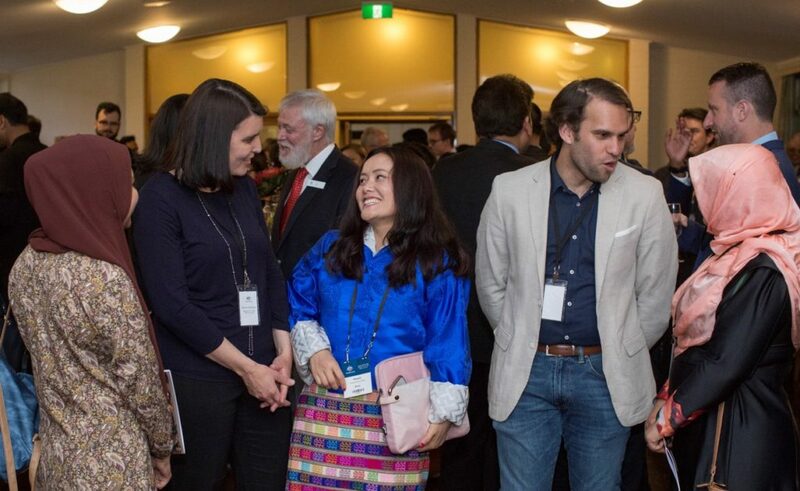 The inaugural Australia Awards – South and West Asia Scholars Forum was designed to facilitate institutional and people-to-people and links between Australia and South and West Asia. 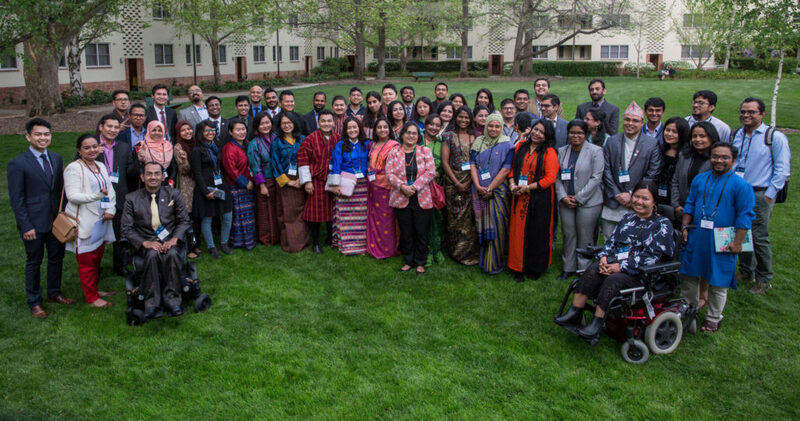 Australia Awards scholars from South and West Asia, selected through a competitive process, came to Canberra in October 2018 for a Scholars Forum supporting institutional and people-to-people links between Australia and the region – a first for Australia Awards. The inaugural Australia Awards Scholars Forum for South and West Asia attracted over 100 participants, including 58 Australia Awards scholars from South and West Asia, alumni, senior diplomats from the region, representatives from Australia’s education institutions and the Department of Foreign Affairs and Trade (DFAT). Ahead of the Forum, DFAT hosted a Welcome Reception at the Australian National University (ANU) on Tuesday 16 October. Formal proceedings commenced on Wednesday 17 October at the Old Parliament House in Canberra. Simon Merrifield, First Assistant Secretary, South and West Asia Division, DFAT delivered the keynote address, setting the tone for the Forum with a high-level overview of the event’s theme, LEARN | LINK | LEAD. Mr Merrifield outlined the importance of Australia Awards for Australia, “Australia Awards increase the impact of other aid interventions across a range of sectors, encourage a positive view of Australians and their country, and enable ongoing contact with Australian people, businesses, institutions and governments”. The keynote address was followed by an inspiring response from His Excellency Mr Somasundaram Skandakumar, High Commissioner of Sri Lanka. Scholar Syeda Farrukh from Pakistan described these opening addresses as “captivating”, stating that they will “remain front of mind” for her for some time. The theme for the Forum reflected on the Australia Awards experience: LEARN: scholars acquire the knowledge and skills to drive change and contribute to development in their countries; LINK: they create and nurture lasting connections between Australia and their countries, professions and the region; and LEAD: scholars return home and become part of an influential global network of leaders and advocates making a difference in their respective fields and countries. Dr Stephanie Fahey, CEO Austrade and Dr Robert Styles, International Development Adviser, ANU, shared insights with scholars on how global linkages build human capital, generate innovation, and contribute to economic growth. Highlights included discussions on key skills for future graduates and how Australia Awards scholars can be drivers for growth and innovation. Dr Fahey advised scholars that both technical skills and soft skills are required to place them in good stead to impact the future. Scholar feedback from this session was highly positive, with one scholar posting: “this presentation made me realise the importance of networking in building our professional capacities, and to lead forward”. A Diplomatic Round Table was held with H.E. Mohammad Sufiur Rahman, High Commissioner of Bangladesh; H.E. Lucky Sherpa, Ambassador of Nepal; H.E. Babar Amin, High Commissioner of Pakistan; and H.E. Somasundaram Skandakumar, High Commissioner of Sri Lanka – together with James Hall, Assistant Secretary, Afghanistan and Pakistan Branch, DFAT. Scholars were offered insights into their home governments’ perspectives on Australia Awards and how the modality enhances relationships between Australia and the region. Interactive mobile technology was integrated into the event, with participants providing real-time feedback during each session and at the end of the Forum. Participants were also given the opportunity to receive their professional images through a text message to aid them in their social media engagement, made possible through WalkerKam technology. Social media and traditional media coverage for the event was highly successful. There were 55 trackable social media posts across channels regarding the Scholars Forum and 119 professional images were brought into the private and public social media channels of Forum participants as a result of WalkerKam. Traditional media coverage included three dedicated SBS interviews. Australia Awards scholars and alumni gave insightful presentations on their budding linkages in Australia. The Forum was co-compered by dynamic scholars who helped guide the Forum’s proceedings. The Forum broadened the scholars’ experience outside their academic pursuits, offering them an opportunity to develop professional networks with Australians, senior diplomats from their countries, alumni, and other scholars from their countries and the region. Australia Awards scholar from Pakistan, Mehak Masood suggested that the values and lessons learnt from the Forum will influence the scholars throughout their education experiences and professional lives moving forward. Of the 51 scholars who responded to the Scholars Forum evaluation: 98% confirmed they gained new knowledge and ideas about developing professional linkages with Australia or within the South and West Asia region; 100% confirmed that, following the Forum, they were motivated to increase their professional linkages with Australia or within the South and West Asia region; and 98% confirmed they made new connections through the Forum.